In 1988, I left school. Throughout my time there, I didn’t have any exposure to computers, apart from when one of my friends typed Hello world onto a computer screen. At college I took A level Maths, Statistics and German. But even then, computing (or anything to do with tech) didn’t enter my mind. Instead, I wanted to be a social worker, so I took a Social Science degree. Before I left for university, I learned to use a typewriter. 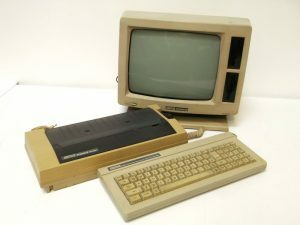 I duly typed all of my university essays until my third year, when my dad bought me an Amstrad word processor. After graduating in 1992 I realised there weren’t many (or any) jobs out there. Eventually, I signed up for a master’s in Tourism Management. An incentive for choosing this course was the extra £10 the government were adding to the income support I would receive while studying – music to the ears of a student. Interestingly, the only other course the government were offering the extra £10 to was Computing. But I still didn’t even consider this as an option. As the university had a computer room full of new Macs, my word processing improved – with a little help from Clippy. During my time at university, I had a work placement at the South Devon Green Tourism initiative. The team needed a database of the tourism businesses in the area, including attitudes to green tourism and what they were doing about it. The only way to do this? Program it. The tricky bit? I’d never programmed before. Desperately needing the placement to be successful (it would provide the key reference for my future job applications), I got stuck in. Luckily, I was living at home and my dad had a computer – he used it for his small business. With help from my dad and the son of one of his friends (a programmer), I discovered that a database called Paradox might be able to do the job best. The very next day I bought Paradox and two large How to program in Paradox books and spent my evenings and weekends teaching myself. Sure enough, by the end of my placement, I’d built and populated a database to the delight of my boss. Phew. At the end of my master’s, my attempts at getting a job in tourism failed – everyone wanted at least a couple of years’ experience. But, not long after, I spotted an ad in a job agency for Reuters. The team needed someone who could speak German. At the time, they had an outpost in Devon. Fortunately, when I was 17 (in an attempt to actually pass my German A level), I had spent the summer and the following year working in Germany. I applied straight away. I got the job. My role consisted of researching and inputting the equity-related company announcements for companies listed on the stock exchanges in Germany, Austria and Switzerland (mergers, acquisitions, dividends, stock splits etc). Every morning, the financial newspapers and stock exchange publications from each of these countries were flown over – straight to my desk. Using these, I researched the data and inputted it into Reuters’ system, then this was transmitted to Reuters’ clients around the world. Effectively, I was a human API. During my early days at Reuters, the computer system I was using to enter data was evolving. I was using it every day, so I was constantly asked for feedback and suggestions as to how it could be improved. Looking back, this was very agile – my suggestions were implemented really quickly. From this, it dawned on me that the future of the workplace was going to revolve around technology. It was this and a ‘if you can’t beat them, join them’ philosophy that gave me the incentive to do something significant, get ahead and not be left behind. I started to apply for developer (or programmer, as it was called back then) graduate trainee schemes. Eventually, I was accepted onto the Royal Bank of Scotland graduate trainee scheme as an analyst programmer. It was here that I discovered a love of technology – coding, testing, analysis and (most importantly) delivery.